As well as a balanced diet and active lifestyle, fluid intake is also important to good health. A shortage of fluid can lead to dehydration, resulting in headaches, loss of concentration, joint pain, poor skin conditions, and other symptoms. 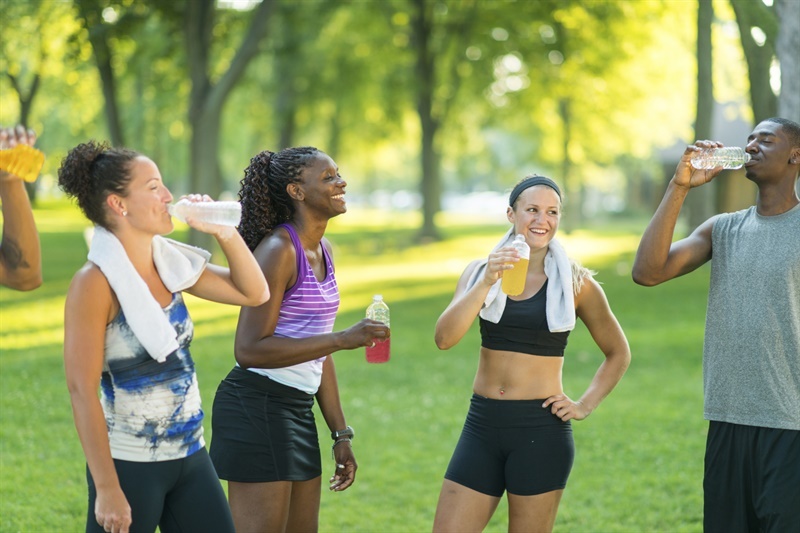 Each person should aim to consume around 2 litres of fluid from food and drink each day, and even more in hot weather or while exercising. Soft drinks can provide an enjoyable and refreshing way to reach that target. With an extensive range of low-calorie and no-added-sugar products, consumers can enjoy soft drinks as part of their diet while also controlling their calorie intake. To ensure a healthy and balanced diet, the Government recommends that at least five portions of fruit and vegetables be eaten every day. Fruit or vegetable juices and smoothies can count towards the 5 A Day target. Experts agree that the best way to maintain a healthy weight is by balancing the calorie intake from food and drink with the energy expended in exercise. That is why a varied diet—including adequate fluid intake—and an active lifestyle are fundamental to leading healthier lives. The latest official guidance on managing overweight and obesity among children and young people from the National Institute for Health and Care Excellence (NICE) can be found here. There are many different types of soft drinks available and if consumers would like to count their calorie intake, there is full nutrition labelling—including number of calories—on all soft drinks packaging so they can make informed decisions about what they are drinking. If consumers would like to cut their calorie intake there is a wide variety of soft drinks that contain few or no calories currently available and through continuing innovation the number is significantly growing. However, like all food and drink, it is important to manage consumption of soft drinks within a balanced, varied diet and an active lifestyle. According to NHS guidelines, to stay healthy or to improve health, adults need to do two types of physical activity each week: aerobic and muscle-strengthening activity. How much physical activity you need to do each week depends on your age, what you do and what you eat and drink. Find out more. The soft drinks industry plays a positive role in encouraging physical activity and better eating habits in the communities in which it does business. Over recent years BSDA members have taught children and young people about healthy eating and inspired them to lead active lifestyles. If you would like to find out more about the initiatives our members are currently engaged with click here. Over the past 30 years, the incidence of dental caries has decreased in all social classes in Great Britain, mainly due to the introduction of fluoridated toothpaste and improved social, economic and environmental conditions. The most important factor in maintaining good dental health is appropriate oral hygiene. This means that brushing teeth twice a day with fluoride toothpaste and visiting the dentist regularly will reduce the risk of dental caries considerably. However, for small children we would also support the British Dental Association’s advice to use a straw, not to put soft drinks or fruit juices in baby bottles or soothers and to avoid giving soft drinks to children at bedtime, after they have cleaned their teeth.